In 2016, the official opening of the Sitech Asset Health Center (SAHC) took place, nowadays more than 500 factory installations are monitored, aiming at analyzing trends that provide information about the condition of these installations. This information enables Sitech Services to take action, even before something goes wrong at the factory. 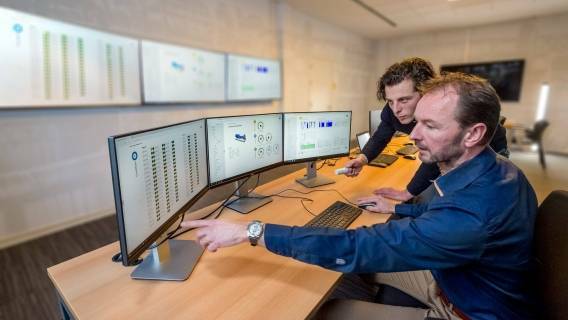 Central monitoring of the condition of an extensive range of installations is considered a first in the Western European process industry. By using and combining as much data as possible, we realize reliable predictive maintenance. During a successful pilot, a digital model of a filter was able to predict an upcoming defect six days in advance. A breakthrough, because the profit from this foreknowledge is considerable. Think of in time stopping and quicker restart of an installation, or the deployment of technicians during daytime. The aim is to monitor at least 5000 equipments within three years, whether or not on the Chemelot site. With the data entering the SAHC, Sitech Services can establish a link between failure behavior of equipment and the data that can predict this failure. This involves a combination of process, machine, instrument and environment data. The computers of the SAHC establish relationships between the enormous amount of data collected in the factories. Based on this, the Sitech experts can develop a predictive model that indicates when an installation is likely to cause a malfunction. The timely prediction of a possible failure has a positive effect on safety, reliability and availability of the installation. In addition, fixed and variable maintenance costs decrease due to timely intervention. This is in line with Sitech's vision on maintenance, which aims to bee 100% predictable. The SAHC makes it possible to monitor all important factory installations remotely. The simultaneous monitoring of different types of installations makes this concept unique. This is possible because Sitech Services provides maintenance for various factories at the Chemelot site: AnQore, Arlanxeo, Borealis, Fibrant, DSM Stanyl and OCI Nitrogen. In addition, the collection of measurement data on installations is becoming increasingly accessible through the use of wireless measurement techniques. Sitech is closely involved in Smart Industries field lab CAMPIONE, which aims to make maintenance 100% predictable.